“MAD” Science on Expedition 376! Scientific ocean drilling started back in the 1960s with “Project Mohole”- an attempt to drill down through Earth’s crust, eventually reaching the Mohorovic discontinuity- the boundary between Earth’s crust and the mantle. Unfortunately, this attempt proved unsuccessful, but what it DID show was that deep-ocean drilling was a viable means of obtaining valuable geological samples that were previously inaccessible. One of the first scientific ocean drilling vessels was the Glomar Challenger, which then gave rise to the JOIDES Resolution and the Chikyu, among other platforms. Take a look at the video below to give you a general idea of what we’re talking about with reference to drilling/coring. 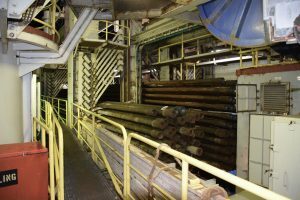 Each pipe is 9.5m (~31ft) in length and weighs 874kg (1925lbs). 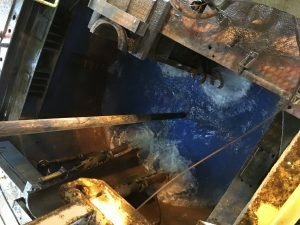 The large iron roughneck on the rig floor puts together a drill string by connecting sections of pipe, and then the drill string is lowered into the water through a hole in the ship (yep, you read that right!) called the moonpool. Sections of pipe wait to be lowered into the ocean! Once the drill string is lowered to the seafloor, coring operations can commence. The JR employs different types of drill bits depending on what type of material we are obtaining. For Expedition 376, since we are drilling into an active submarine volcano, we will be using the RCB: Rotary Core Barrel, as it’s made for drilling into igneous rocks and very hard sediments. These drill bits can only last for so long- eventually, they get worn out, so we have to bring the ENTIRE drill string back up, one pipe at a time, until we reach the bit at the bottom of the drill string and can change it out. Then we start the deployment process all over again! Core barrels are lowered through the pipe in order to retrieve and store the core material cut by the drill bit. These barrels are then pulled up through the drill pipe to the rig floor, and technicians will then extract the long cylinder of rock. At this point we hear the announcement, “Core on deck”, which spurs everyone in the lab into action!